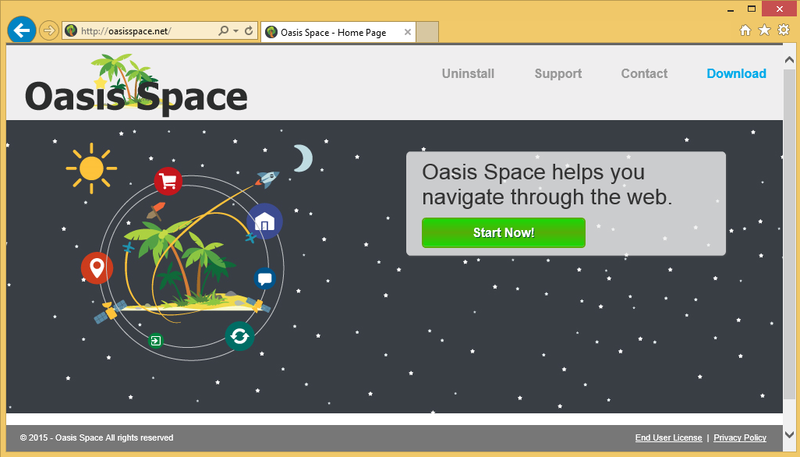 What is Oasis Space Ads? Oasis Space is a potentially unwanted program (PUP) that has to be eliminated from your computer at once! It is, in fact, a suspicious plug-in that falls into the category of adware applications. All its features can be summarized into one word – ads. Unless you uninstall Oasis Space Ads from your personal device, all kinds of commercial and non-commercial advertisements will not leave you alone. The sad fact is that the application is full of lies. If you just open its page (which is official), you will soon see all the lying done in order for the users to download and install the PUP. The page is made to look nice, with all sorts of images put onto the screen. Moreover, there is a slogan present: “Oasis Space helps you navigate through the web”. One question arises – how will it make my experience better than it already is? The answer is rather disappointing – the program will not help you in any way. It is supposed to help you compare online deals and find the best prices. Sadly enough, these features do not work as promised. Why is Oasis Space Ads dangerous? How did my PC get attacked by Oasis Space Ads? There are some people that are tricked into downloading the adware by the promises on the official webpage. On the other hand, there are tons of users who complain about the application having attacked the computer without their consent. As you can see, the program is put in freeware bundles that are acquired by people from P2P sites. If the right installation mode is not chosen (the Advanced or Custom), the PUP sneaks into the PC with ease. How to remove Oasis Space Ads from my computer? If you really want to delete Oasis Space Ads after having read all of this, you should wait no longer and download a reputable anti-spyware program Wipersoft . A reliable tool will surely remove Oasis Space Ads from the computer once and for all! Just don’t forget to update the application in future.